It’s an invigorating process to assist homeowners with the planning and execution of their dream kitchen. We’ve been able to fit dishwashers in compact areas and construct islands that are the perfect height for rolling out gingerbread cookies. While interior designers can proclaim something to be a trend, it cannot be so without adaptation from homeowners. 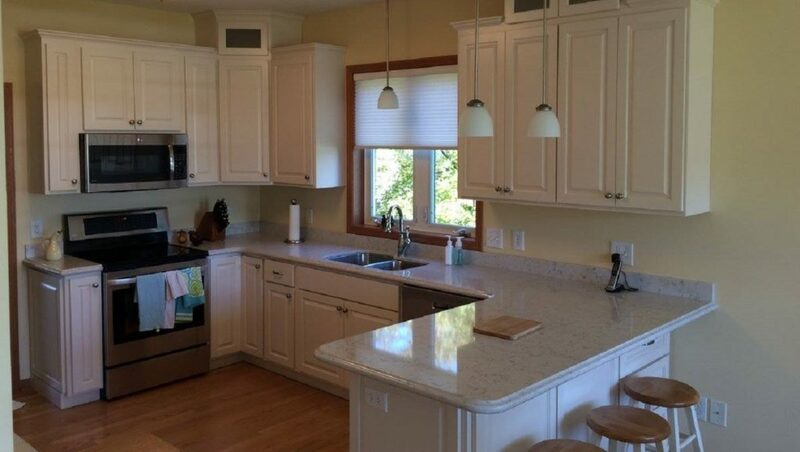 One kitchen remodeling trend many of the homeowners we work with are repeatedly requesting is white cabinets. Below are just some of the reasons why they love them! Timelessness: In most kitchen remodeling budgets, cabinets receive the highest allocation. Simply put, they take up a lot of real estate and are costly to manufacture and install. White cabinets avoid the decision of having to select a wood finish that dates a home quicker than is needed. You can also rest easy knowing that your kitchen can easily be updated with a new paint color, which is a much more affordable option than new cabinets. Versatility: Whether your kitchen has an upscale or shabby chic vibe, white cabinets are workable. This adaptability can be appealing to potential home buyers. While they may not see eye to eye with you on your kitchen décor, they know they won’t have to completely gut the kitchen when they move in. White plays well with nearly every other shade, making it convenient to coordinate countertops, appliances, and lights fixtures, and backsplashes. Spaciousness: In the realm of interior design, white invokes a feeling of brilliance. Utilizing white also has the ability to magnify the size of a space. White cabinets also subtly suggest a hygienic atmosphere, as they do not have the ability to mask stains. Appliance Coordination: All major manufacturers produce appliances in white. This allows homeowners to coordinate the color of their cabinets and appliances. One benefit of this is that the kitchen will appear larger. With appliances being a major budget allocation in most kitchen remodels, it’s wise to opt for neutral colors that will stand the test of time. Physiologically Sound: Color therapists praise white for the optimistic and peaceful feelings it promotes. This makes it an ideal cabinet color for those that use cooking as a way to relax after a long day. Interested in a Custom Home Renovation Estimate? Click Here. "Our new room is more than we dreamed it would be." - Paula F.
"I want to commend Eric for doing a super job adding things into the project that my brother & I would decide also needed work after we saw the work that was already done. I’m also grateful that Eric would bring up things that we hadn’t thought about to make us aware." - Sandy D.